Two Little Flowers: Fabric - Yay! I love fabric. Give me great big piles of it to snuggle into...as long as it was natural fibres...and I would be one happy bunny. I went off in search of work pants the other day, with the girls in tow. Not recommended! We only managed one shop and one trying on session. To be brief about it - I grabbed a pair of pants that seemed ok and ran out the shop (of course, paying first). What I ended up with was a pair of nasty clingy, static-y polyester! I do not like clingy polyester. Needless to say they were returned. When I sew for the girls, I always use cotton fabric. Often with some elastine content. 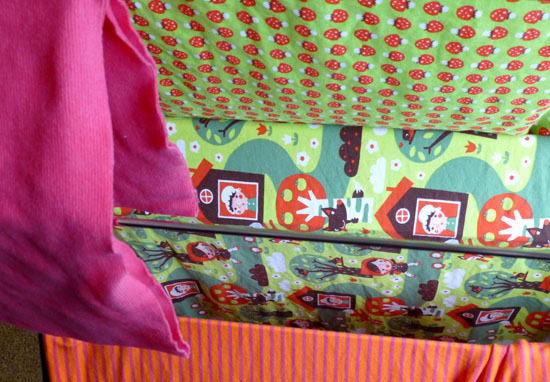 I love the funky fabric that the likes of Dots n Stripes and Ottobre sell. Those bright colours, fun patterns and funky stripes would be my choice for their clothing first time every time....but, they are pricey! So I really don't buy them very often. Ava is in need of winter clothing - simple stuff...leggings and long sleeve tops and a pinafore or two. To get me started, I decided to buy a few pieces of fabric from one of my favourite shops. The fabric arrived this morning and has been washed. That is as far as I have gone really. When I finish up here, I will be clearing all the *stuff* off of our dining room table and spreading out a few pattern sheets to trace a pattern or three. I absolutely love the one with the lady in the house! Very cute! I love finding bright colourful fabrics too, usually at opshops! An idea for winter clothing...I made my niece a padded vest for her birthday. With some jeans and a long sleeve top, that would be perfect! Cant wait to see what you make! Hi Taz - yes Little Red Riding Hood is super sweet. So far I have only cut our the pink and orange stripes into a little flirty skirt... A padded vest is an excellent idea!